The second single taken from Taco's 1983 album 'After eight' was another old song set to synthpop music. Irving Berlin wrote 'Cheek to cheek', performed by Fred Astaire in the 1935 movie 'Top hat'. Unlike the previous single, this one didn't become a hit. Taco continued to record and release albums throughout the Eighties, focusing mainly on the German market. 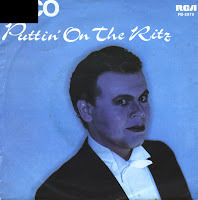 Dutch singer Taco Ockerse made his debut in 1982 with a cover version of 'Puttin' on the ritz', which was written by Irving Berlin in 1929. The song was used in several movies, including 'Idiot's delight' (1939), performed by Clark Gable, and 'Blue skies' (1946), performed by Fred Astaire. Taco's version included a tap dance solo as a tribute to Astaire. Also included in the recording are parts of 'White Christmas', 'Alexander's Ragtime Band' and 'There's No Business Like Show Business' (all written by Irving Berlin), and 'Gotta Dance' from the movie 'Singin' in the Rain'. Taco's single reached number 12 in the Dutch Top 40.